Thread: Carpenters Star pattern...using a 10" Layer Cake? I have a layer cake that I am wanting to use. I was wondering if anyone has used a layer cake to make a Carpenters Star? If so, did you have to cut your 10" down to the size what the pattern says, or did you use the 10"? It seems like this parttern could use a layer cake, but I cant seem to figure out how to do that. That sounds like a great idea. A carpenter star is on my list to make this year and I have several layer cakes. I hope someone has some suggestions. If you want to use 10" squares, it will take more than 1 layer cake. A carpenter's star is 64 blocks. 48 are half triangles. There's a tutorial on the board for the carpenter's star that's awesome. It's a fun block no matter the size. The Carpenter star pattern relies on using only 3 colors to get the "illusion " of different geometric blocks. IMHO layer cake pkg have too many colors. Quilter catch has a free pattern for 24" block that I have made and added 3" borders to make 30" wallhanging. Also Keepsake quilting has bed size pattern for Carpenter star quilt . Also sever5al people on this board have info on how to make larger CS blocks. I really like thgis block and have made several as wallhangings. Also it is easy and quick block. There are mny other patterns to use layer cake pkg. I was able to find one reference. I googled Carpenter's Wheel, not Star. I couldn't find a picture, but she did describe using 2 layer cakes. Here's what I used. I made one 1 1/2' squares which finished 1 " and another 2" which finished to 1 1/2" squares. Matching the seams was the challenge. You can use this reference sheet and apply it to any size you like. Hope this helps. The Carpenter star pattern relies on using only 3 colors to get the "illusion " of different geometric blocks. I disagree. I've seen some beautiful Carpenter's Wheel quilts that were scrappy. However, they DID have one thing in common - a unified background, such as all black or all white. http://www.quiltfrog.com/fourhour.html I used this pattern and it's very easy. I think you could use your charm pack with this and make it scrappy. Just use a solid background fabric. The ones I've made were 3 colors but I do like the look of the scrappy one pictured. It would take a bit more planning but would be worth it. I made a scrappy with lots of browns/tans/black and it turned out nice too I think...it actually came in a kit I bought at a cute little shop in Grand Rapids, MI. Super easy to make, you'll love it! You are right. I guess I have never seen one made scrappy. It is pretty. I personally like the 3 colors or at least similiar tones due to I can see the secondary blocks better. Last edited by bigsister63; 07-05-2013 at 12:16 PM. Love the look of the scrappy one. The one in browns is also very pretty. I say go for it with the layer cake and let us see the results. Wow this is a beauty!!! Quiltfrog has several different patterns using 1/2 sq triangles. I have been working my way through them. So far I have done the Carpenter's Star, Around the Half Square, and the 2008 Christmas quilt. I did the Christmas quilt pattern in blue and brown with a white background for my BIL. It was stunning. I haven't done it yet, so I probably shouldn't give advice! I am planning a Carpenter's star that will be a "controlled scrappy" with my fabrics all from the same color famikly, but varying in value. I figure if I keep the background unified, and alternate dark/medium-dark with light/ medium-light I'll get the 3-D effect. So I say separate your layer cake fabrics into value groups, and go from there! I am making a batik star quilt (not Carpenter's Star this time) using Hoffman's Batik Crackers (10" squares) It works out beautifully IF I make my HST diagonal seams .5 cm instead of 1/4". That's the width of my regular foot. This way, each square is in 8 HSTs, 4" finished size each. When I am done, I will have 4 extra squares after a twin quilt for DGD. I usually prefer NOT to use precuts, but I am glad I did for this quilt. I agree with Alisonquilts about sorting the squares. I have 2 light and 2 dark segments in each of my stars. Thank yo everyone for the help. I think I found my solution. I totally agree with Peckish, it looks beautiful with scrappy pieces BUT you must have 1 unifying colour for the background as per her suggestions - black, white etc. LOVE, LOVE, LOVE your quilt. I love the scrappy Carpenter's Star!!! I have made one similar to the brown one that is more controlled scrappy, but I think my next one will be more scrappy like this one...maybe playing in my sewing room this weekend! Funny how easy it is to get into a mind set. I would have said three colors is optimum, but absolutely love both the scrappy and the brown controlled scrappy. Is it true that you just have to keep in mind where the dark and where the light goes? Carpenter's Star is one of my favorite patterns. I made mine using 3 different fabrics. It came out lovely. Usually I don't make a pattern twice, but Carpenter's Star is one that I will make again. 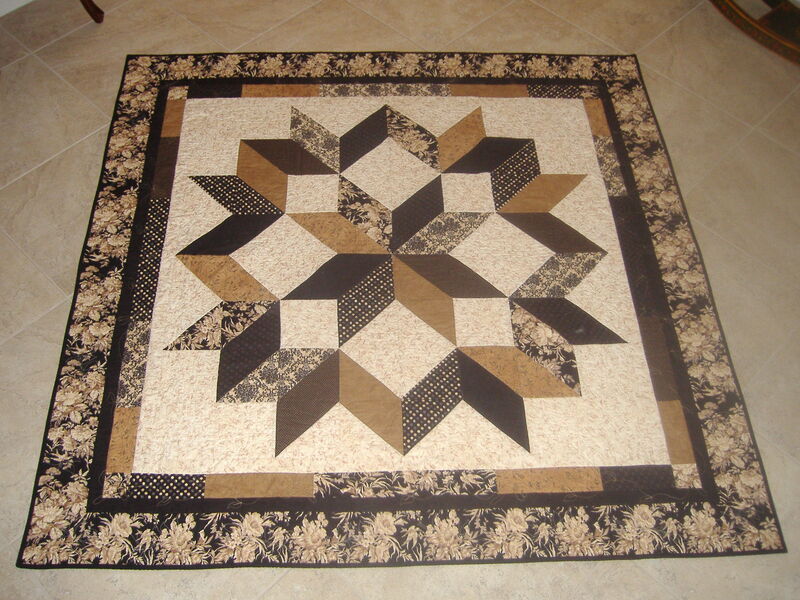 Calico Carriage Quilt Designs has a great Carpenter's Star pattern. They have awesome designs. Check out their website. I have ordered several of her patterns. 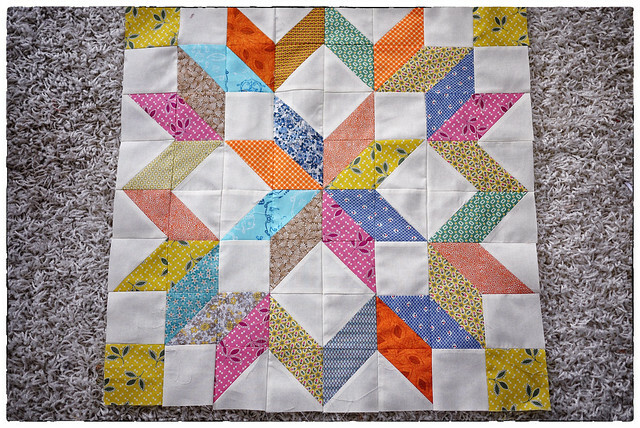 I am working on this same pattern with a red and yellow star in the middle and blue and orange around it, with white background, just got it ready to put together, I have a small request. Would someone please write and tell me where to start putting it together??? ?